Obituary. Mr. Joseph Rudezky. - Dalby Herald, 10 February 1931, p. 3. 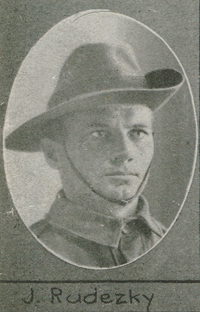 [...] Joseph Rudezky was invalided to Australia in 1917 after being wounded at Pozières, which left him with a disfigured left hand. The first few months he spent in Brisbane before starting his travels between Brisbane and the cane-cutting areas of Halifax, Ingham and Townsville. He had tuberculosis, probably contracted at the front -- he'd 'had a cough ever since' France -- and although it was rapidly progressing, he kept on working as long as he could: because his tuberculosis was not officially recognised as a war-injury, he was ineligible for treatment as a veteran. However, like some other Russians, he was fortunate enough to come across compassionate Australians and one, Dr Melville, a medical officer, took a personal interest in his case. Melville wrote: 'If his statements are true, and I have no reason to doubt them, being very much impressed by the man's appearance and the way he made the statements, I consider that his T.B. is the result of his exposure in Gallipoli and France, and recommend that he be given the benefit of the doubt'. Owing to Melville's support, Rudezky then received better treatment. While in the sanatorium in Stanthorpe, Queensland, Rudezky married a local girl and took up residence in the soldiers' settlement there. They later moved further north to Dalby, for its dry climate, which prolonged his life a few more years and allowed him to bring up his five daughters before he died, in 1931.